The Mid-week Wayfarers ride this week attracted 30-40 people to coffee at Poppy’s, Badshot Lea. From there we split in several directions, with 9 of us heading for lunch at The Squirrel, Hurtmore. After lunch we again split into 3 groups, with Chris Jeggo deciding to ride with me via Compton, the climb past Watt’s Gallery and descending through Onslow Village. Chris then suggested that as we would practically be passing Harold & Kath Coleman’s house we should call in, which we did. 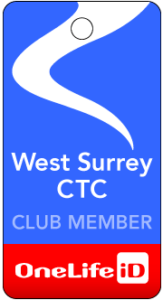 Although Harold hasn’t had any involvement with the West Surrey for a number of years now, our long standing members will remember his many contributions to the club’s activities in the past. To cite one example, our favourite award, The Wooden Crank, was made by Harold and is a twice life size replica of a Campagnolo Record crank. As it turned out, Kath wasn’t in when we called, being out on some musical activity according to Harold. She had, however, arranged for a lady with a dog, to go out with Harold for a walk. So we went in and chatted with Harold for 10 -15 minutes until the lady and the dog arrived. Harold was pleased to see us and suggested we call again.